Happy Monday! Aletha here, and I hope everyone had a great and creative weekend. I know that I had a good one. I was in my studio most of the time. I love it when that happens. My project this week is really for spring time. I know, we just got over Halloween, and now getting ready for Thanksgiving and Christmas, but I needed some spring and summer colors. It seems like all I have been doing is Halloween. Now that’s over, and I have been dealing with fall colors. I needed some sunshine! 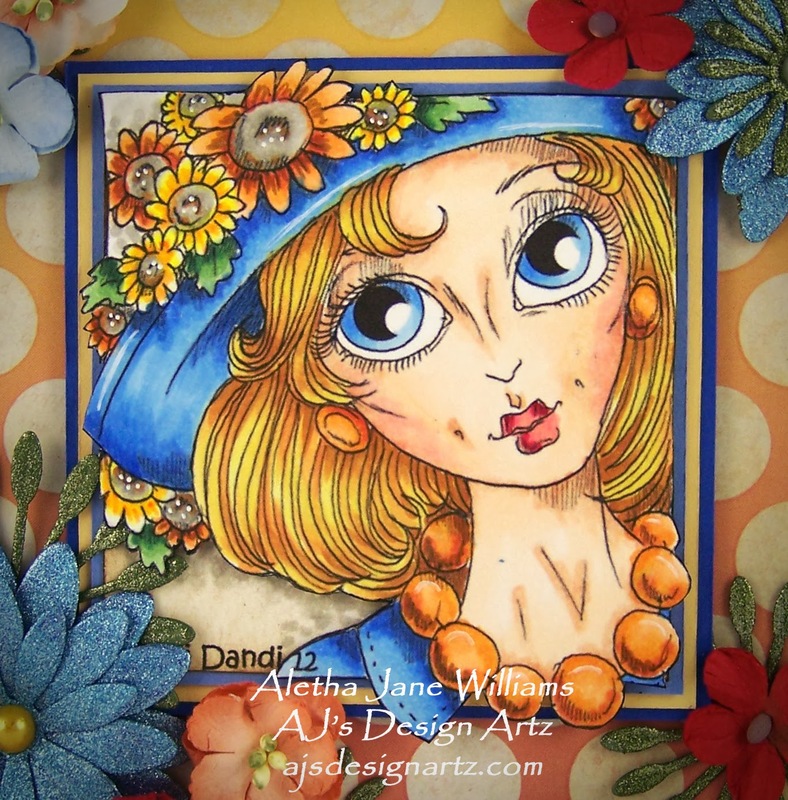 I would like to introduce you to Betti, from Rick St. Dennis’s Randi Dandi series at I Brake for Stamps. 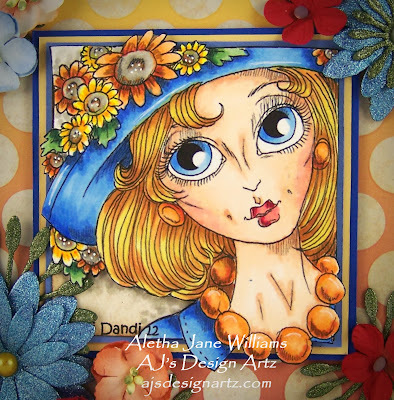 I colored her with Copics, of course, and added a few handmade flowers to enhance the spring time mood. I adore Rick’s Randi Dandi series. Most of the designs have marvelous hair styles, and I love coloring hair. My handmade flowers came from several dies. The biggest ones are from Cheery Lynn’s DaisyStrip. After I cut them and before I assembled I added some Viva Décor 3-D stamp paint in metallic light blue. I then assembled and added yellow flat-backed pearls to the centers. 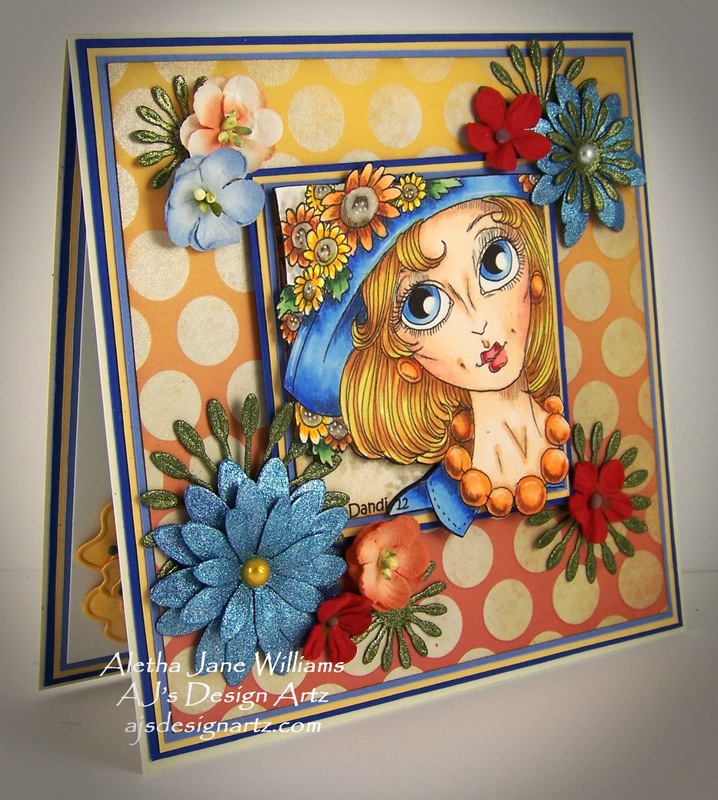 My little green accents were created with Spellbinder’s Die D-Lites Blooms One. I added moss green 3-D stamp paint for all that sparkly. I have yet to make this die into a flower, maybe next time. I know that I am going to like it. The really tiny flowers are from Petaloo. 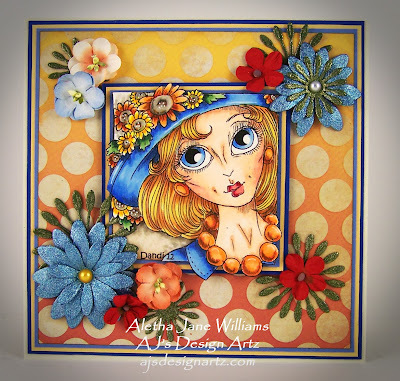 I hope that you stop by our I Brake for Stamps blog every day. There is always some amazing designs by Della’s very talented design team. Thanks for stopping by. This very cheerful card will be available in my Zibbet shop. If you have any questions, please contact me.